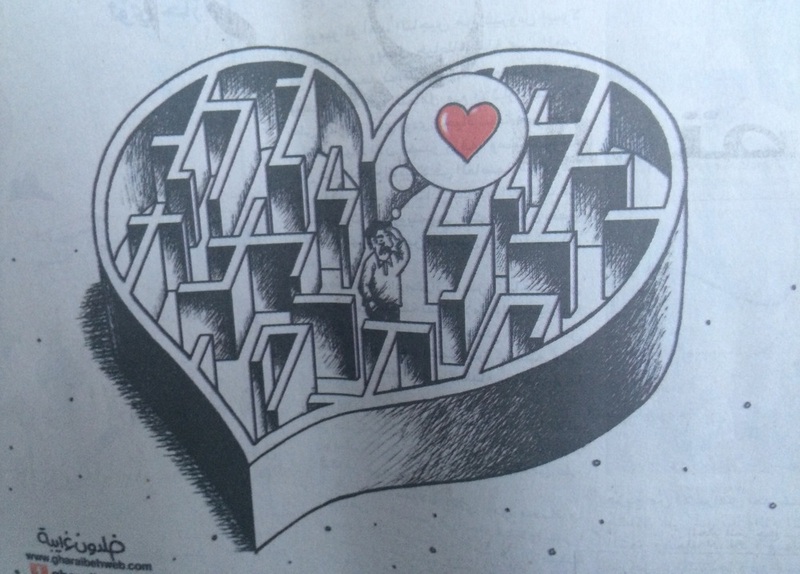 Taken from the local paper in Amman on Valentine's Day. A few weeks ago, the weather took a turn to the gorgeous in Amman. Beautiful, sunny, 70 degree days. I decided to knock off early after Arabic class; I needed a day to let my heart and soul settle after a few raw weeks…who I am kidding, months! I went for a walk in my neighborhood, which is one of the oldest neighborhoods in all of Amman. It’s the quaintest, loveliest walk in all of Amman, in my humble opinion. I set my sights on what I like to call an art compound -- a collection of small houses with exhibitions, outside sculptures, a café, and a beautiful garden overlooking old Amman. It’s one of my favorite areas in the city. I sat there with my feet up and a minted-lemonade slushy in my hand. I took a breath. I breathed deeply for the first time in months. I watched as the birds (assuming that they were pigeons) flew in migratory patterns high above the buildings and minarets of Jabal Amman as the sun started its slow afternoon descent. It couldn’t have been more Middle Eastern. All I could do was smile. I felt gratitude. I felt peace. Let’s back up, shall we? I have never, ever voluntarily gone to Amman. Not once. I was evacuated out of Beirut to Amman in the 2006 war. I hated every single second of it, as my heart and mind were focused on my friends in Lebanon. This trip, Amman was supposed to be just a necessary pit stop between the craziness of Beirut and that of the West Bank. I wasn’t supposed to be here, and to be honest, I didn’t want to be here. But then this happened – I was denied entry at the Israeli border. I felt like I got a swift kick to the gut and a two-by-four to my head. Completely discombobulated physically, and hurt like hell emotionally. A year of planning, years of hoping, all altered in one day and not just for this trip. Last month, after talking to an Israeli lawyer, I found out I have a ten-year ban from entering Israel which means I am also banned from Palestine and serving Palestinians there. Even after 10 years, they may never let me. The hard, cold reality is that I may never set foot in Palestine. I wanted to run back to Beirut; it would have been easy. I have friends there who are like family to me, and organizations I believe in and trust; I could have worked with them. But, no -- I intuitively felt I needed to stay in Amman. After 9 hours at the border, an interrogation, being denied and then crossing back into Jordan, I stood in the middle of an empty, dark highway at 9pm, crying. I had 3 Jordanian dinars on me and my suitcase. I had no idea how I was going to get back to Amman or where I would sleep. I was scared and traumatized and exhausted. The last place I wanted to be was Amman. And yet, today, I am eternally grateful for that horrendous experience. Because without it, I would have missed out on one of the hardest and most life-giving experiences I have ever had. The work I have been doing in Amman is how I have dreamed of working with Palestinians for years. I have met Jordanian-Jordanians and Jordanian-Palestinians and Palestinians who have literally made my heart sing. 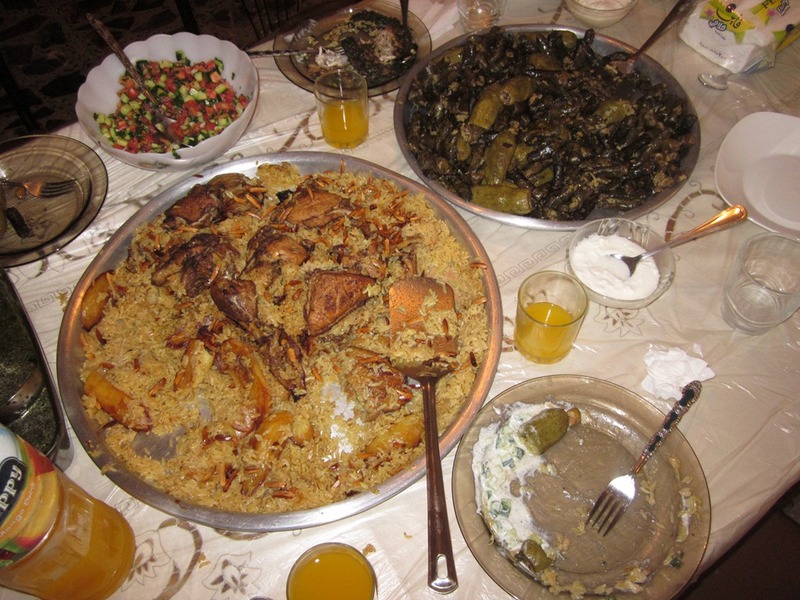 I have had more than one family stuff me with Mansaf and Makloubeh until I thought I would burst, and declare me one of their own. There honestly has been so much goodness here on so many levels. Too much to put into one blog post, but let me give you three vignettes that let you peek into an unexpected 5 months in Jordan. DSPR Training at a Catholic Chruch in Ashrafieh, Amman. The DSPR has been working with Palestinian refugees since the 1950s. They are known as the church in the Muslim Palestinian camps in Jordan. I have had the pleasure of volunteering with them in Jordan since October. Last month, they scheduled a training meeting in a new area, Ashrafieh. This is not a Palestinian camp. It’s a very, very poor area of Amman -- Muslim and Christian. Palestinian, Jordanian, Syrian, and Iraqi. Many refugees. Many needs. The DSPR put together a committee of both men and women, Muslim and Christian, Palestinian and Syrian and Iraqi and held a training for them. We met at a Catholic church in Ashrafieh. We were greeted warmly by the church staff, as was everyone. I met a lady who worked for Catholic Diocese of Amman, a Muslim woman, who covered. She loves her job and she works with Christians every day and loves it. Muslims were welcomed into the church and they entered without hesitation...and it was no big deal. It was normal for them. They knew each other, they were friends, and I watched as they engaged each other with respect. I sat with my mouth open. Just a normal interaction in Jordan and all I could think about is what a big deal this would be in America. And that made me sad. Remember that time when I invited a Muslim to speak at my church for an event I was holding? So, I sat at the training and observed. I watched as the DSPR brought a group of people, different religions and different nationalities, together for a training. It was an invitation to work side by side to serve a very poor community, to serve their neighbors. They learned, they laughed, they enjoyed fellowship together. They were indeed neighbors. And IT WAS NO BIG DEAL. 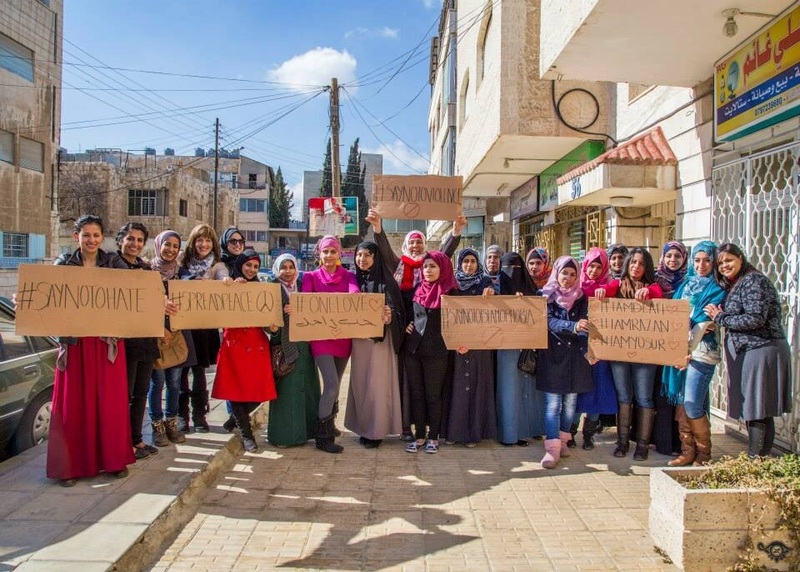 Hopes Scholarship Students, Volunteers, Graduates & Guests joining in one group shot - holding out signs in solidarity with Deah, Razan and Yosur, showing our stance against Hate, Violence and Islamophobia, and our passion for Peace and One Love on this Valentine's Day. Hopes for Women is a nonprofit that provides higher education scholarships for refugee women from the ages of 19-30. Palestinian refugees from Gaza, Marka, Zarqa, Jamal Hussein, Irbid, Jerash camps and those also living in Amman. Currently, they are sponsoring an Iraqi refugee and hope to expand the program to Syrian refugees next term. In addition, the staff, volunteers, and students have a bookclub once a month with some sort of seminar. Attending the bookclubs has been by far the most encouraging part of my trip to date. I want you to consider that these young women are refugees; getting an education is usually out of their grasp. These bookclubs provide an opportunity for them to gather together, have fellowship, and learn together. The volunteers have provided a safe place for these young women to go to share their experiences and struggles and hopes. I’m not sure who I am more impressed with -- the volunteers or the students. The volunteers, who are all educated, bright, young women themselves, give their time and talents to teach their younger counterparts life-skills and mentor them. The students are incredibly thoughtful, motivated young women who are following their dreams and working hard at their education. It’s quite inspiring. Just imagine what these young women could accomplish in their communities; think of what they could provide for their families. And think of how they could inspire the next generation! Women. Refugees. Palestinians. Hoping and building each other up for a better future. After Zumba class on Thanksgiving last November. I was approached to teach Zumba at DCC one of my first weeks in Amman. I wasn’t sure how it would work, but the thought of teaching Zumba to deaf teenage girls made my heart happy. This center serves the deaf community around Amman and other cities and villages. They provide services, sign language classes, and a place for the youth to gather. Thursdays are women only days. The girls are all refugees -- Syrian, Palestinian, and Iraqi. Like I said, I wasn’t sure how this was going to work or even if it could. I was so surprised. We turned up the music loud, so they could feel the vibration. Just using visual directions, they followed me. They laughed, they danced, they let loose and they got in some exercise. Teaching them Pilates and Zumba has been one of those special, one-of-a-kind, life-giving experiences. I have been able to offer them physical fitness, which is not readily available to refugees, and to have a bit of fun. The first class, I almost started to cry to see the joy on their faces. In that moment I thought if this is why I was denied access into Israel, then it is all worth it. So, thank you Jordan. Thank you the warm welcome, the hospitality, the opportunities, and for letting me hope again. You have expanded my heart. And to think I almost missed out.